“Note the significant dimensions of Christian spirituality. First, it starts with the initiative of a loving God who is seeking a relationship with his creatures. Third, the result of this responsiveness to seeking God is not that we become angels or religious persons, but more fully human…. Fourth, spirituality then is not a once-for-all event but a continuous process that is concrete but never finished. Fifth, the practical outworking of this spirituality is that we align ourselves with God’s intention for his creation, which is the kingdom or pervasive and life-bringing rule of God on earth. Creating wealth and bringing well-being to people is part of this…. Finally, this spirituality is not cultivating extraordinary experiences but rather the infiltration of ordinary life with kingdom justice and holiness” (pp. 64, 65). “Life, for biblical persons, is total and cannot be segmented into two parts: a disposable and normally evil shell (the body), and an indestructible spirit core (the soul). Thus the familiar psalm ‘Praise the Lord, my soul; all my inmost being, praise his holy name’ (Psalm 103:1) may be simply and helpfully translated “Praise the Lord, with my whole life!’” (pp. 65, 66). “Most significant of all, the New Testament hope is not for the immortality of the soul–an essentially Greek concept that involves disparaging the body as a useless encumbrance to the life of the spirit. Instead, the great hope in Christ after death is the resurrection of the body–full personal and expressive life in a new heaven and a new earth” (p. 66). “When we receive Christ, we get saved, not just our souls in the Greek sense. This is a two-stage process. First, our souls, our inner and longing persons, are substantially saved by being inundated by God’s Spirit, thus giving us new bodily and personal life on earth. Second, after our death and when Christ comes again, we are given a new and perfect embodiment through the resurrection of our entire selves, bodies included” (p. 67). “First, it means you go to work as a whole person — not just mind or body, but all that inner yearning and expressiveness that links us with God…. Second, as soul persons with capacity to relate to God, we are given ideas, visions and perspectives that can be implemented through entrepreneurial activity. These may be in the area of church life but also in family life and enterprises in the world…. Third, our actual experiences of envisioning, inventing and implementing as entrepreneurs are an arena of spiritual growth…. Fourth, being a soul person (and a whole person) means being relationally alive through love. We are most godlike in relationships…. Finally, Christian spirituality and its recognition of a soul dimension to human life and work means that personal growth is not a human achievement (through disciplines and practices) but a response to the Spirit’s initiative….Christian spirituality is…God’s empowering presence calling human beings into dynamic relation and expressiveness” (pp. 68, 69). “The marketplace is a location for spiritual formation in three ways. First, it is the place where we get revealed as persons. Our inside is revealed by what we do outside, bu the way we work, by our relationships with people, by the realities of how we go about doing day to day enterprise…. Second, the seven deadly sins, seven soul-sapping struggles that include pride, greed, lust, anger, envy, sloth, and gluttony, are revealed not in quiet times and prayer retreats but in the thick of life, in business meetings, as we struggle over this month’s sales, when we have to deal with an awkward customer or employee…. But there is a third reason….The work we do, if it is good work, is some part of God’s own work in creating, sustaining, transforming or consummating (bringing things to a good conclusion). We are actually partners with God in our daily work” (pp. 70, 71). The Bible describes the meta-narrative of God’s grand work in the history of the world: creation-fall-redemption. These historical themes apply to the entire created universe. “God created all things good. Humans, elephants, trees, rocks, sand, stars—they were all created in a wonderful harmony. This includes [business]. The cultural mandate [found in Genesis 1:28] implies that God built the potential for [business] into the creation. God created humans in His own image, and so the creativity and ingenuity necessary to [engage in business] comes as a gift from God. He also endowed creation with the natural resources necessary for [business]—wood, metal, silicon, electricity, and more. “By man’s choice, represented in the Adam and Eve, sin entered the world. The fall affected every part of creation. Even [business] is stained by sin. The goodness built in from creation is still present, but warped and darkened by sin. “In the third era of history, Christ’s death on the cross and resurrection broke the power of sin and provided redemption to those that have faith. Believers in Christ Jesus have forgiveness of sins through Christ. Christians in the Reformed tradition stress that Christ’s redemptive light shines not only on our own souls, but on all creation. 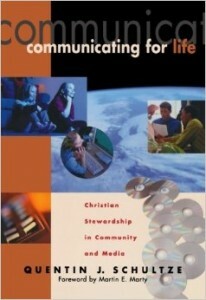 Christ’s rule and His kingdom stretch from shore to shore of the entire universe” (Quentin J. Schultze, Communicating for Life: Christian Stewardship in Community and Media, Grand Rapids: Baker Academic, 2000, 118–121). “Oh, no single piece of our mental world is to be hermetically sealed off from the rest, and there is not a square inch in the whole domain of our human existence over which Christ, who is Sovereign over all, does not cry: ‘Mine!’” — James D. Bratt, ed., Abraham Kuyper, A Centennial Reader, p. 488. In the end God will re-reconcile all of creation to himself. In the meantime, we are called to be co-workers with him in making the world as he intended it to be. This work not only blesses others, it makes us more spiritually mature. Holy. Morally sanctified. Imagine a world in which each person is empowered to discern, develop, and deploy their gifts and calling for the benefit of others for God’s glory! “Discipline…is the means of human spiritual evolution…. [The] motive, the energy for discline…[is] love” (p. 81). “I define love thus: The will to extend one’s self for the purpose of nurturing one’s own or another’s spiritual growth” (p. 81). “Love is an act of will — namely, both an intention and an action” (p. 83). “[Nirvana] or lasting enlightenment or true spiritual growth can be achieved only through the persistent exercise of real love” (p. 97). “Dependent people are interested in their own nourishment, but no more; they desire filling, they desire to be happy; they don’t desire to grow, nor are they willing to tolerate the unhappiness, the loneliness and suffering involved in growth” (p. 106). “Love is not simply giving; it is judicious giving and judicious withholding as well. It is judicious praising and judicious criticizing” (p. 111). “[Genuine] love is self-replenishing activity. Indeed, it is even more; it enlarges rather than diminishes the self; it fills the self rather than depleting it. In a real sense love is as selfish as nonlove. Here again there is a paradox in that love is both selfish and unselfish at the same time. It is not selfishness or unselfishness that distinguishes love from nonlove; it is the aim of the action. In the case of nonlove the aim is always something else” (p. 116). “Genuine love…implies commitment and wisdom. When we are concerned for someone’s spiritual growth, we know that a lack of commitment is likely to be harmful and that commitment to that person is probably necessary for us to manifest our concern effectively” (p. 118). “Love…is a form of work or a form of courage. Specifically, it is work or courage directed toward the nurture or our own or another’s spiritual growth” (p. 120). “The principal form that the work of love takes is attention. When we love another we give him or her our attention; we attend to that person’s spiritual growth” (p. 120). “By far the most common and important way in which we can exercise our attention is by listening….Listening well is an exercise of attention and by necessity hard work” (p. 121). “An essential part of true listening is the discipline of bracketing, the temporary giving up or setting aside one’s own prejudices, frames of reference and desires so as to experience as far as possible the speaker’s world from the inside, stepping in his or her shoes” (p. 127). “The energy required for the discipline of bracketing and the focusing of total attention is so great that it can be accomplished only by love, by the will to extend oneself for mutual growth” (p. 128). “Since love is work, the essence of nonlove is laziness” (p. 130). “Courage is not the absence of fear; it is the making of action in spite of fear, the moving out against the resistance engendered by fear into the unknown and into the future” (p. 131). “The essence of life is change, a panoply of growth and decay. Elect life and growth, and you elect change and the prospect of death” (p. 133). “[All] life represents a risk, and the more lovingly we live our lives the more risks we take” (p. 134). “Adam I is the career-oriented, ambitious side of our nature. Adam I is the external, resume Adam. Adam I wants to build, create, produce, and discover things. He wants to have high status and win victories. Adam II want to embody certain moral qualities. Adam II want to have a serene inner character, a quite but solid sense of right and wrong — not only to do good, but to be good. Adam II wants to love intimately, to sacrifice self in the service of others, to live in obedience to some transcendent truth, to have a cohesive soul that honors creation and one’s own possibilities. While Adam I want to conquer the world, Adam II wants to obey a calling to serve the world. While Adam I is creative and savors his own accomplishments, Adam II sometimes renounces worldly success and status for the sake of some sacred purpose. While Adam I asks how things work, Adam II ask why things exist, and what ultimately we are here for. While Adam I want to venture forth, Adam II wants to return to his roots and savor the warmth of a family meal. While Adam I’s motto is ‘success,’ Adam II experiences life as a moral drama. His motto is ‘Charity, love, and redemption’” (pp. xi, xii). “Adam I — the creating, building, and discovering Adam — lives by a straightforward utilitarian logic. It’s the logic of economics. Input leads to output. Effort leads to reward. Practice makes perfect. Pursue self-interest. Maximize your utility. Impress the world. Adam II lives by an inverse logic. It’s a moral logic, not an economic one. You have to give to receive. You have to surrender to something outside yourself to gain strength within yourself. You have to conquer your desire to get what you crave. Success leads to the greatest failure, which is pride. Failure leads to the greatest success, which is humility and learning. In order to fulfill yourself, you have to forget yourself. In order to find yourself, you have to lose yourself. To nurture you Adam I career, it makes sense to cultivate your strengths. To nurture you Adam II moral core, it is necessary to confront your weaknesses” (p. xii). “We live in a culture that nurtures Adam I, the external Adam, and neglects Adam II. We live in a society that encourages us to think about how to have a great career but leaves many of us inarticulate about how to cultivate the inner life. The competition to succeed and win admiration is so fierce that it becomes all-consuming. The consumer marketplace encourages us to live by a utilitarian calculus, to satisfy our desires and lose sight of the moral stakes involved in everyday decisions. The noise of fast and shallow communications makes it harder to hear the quieter sounds that emanate from the depths. We live in a culture that teaches us to promote and advertise ourselves and to master the skills required for success, but that gives little encouragement to humility, sympathy, and honest self-confrontation, which are necessary for building character” (p. xiiii). “The central fallacy of modern life is the belief that accomplishments of the Adam I realm can produce deep satisfaction. That’s false. Adam I’s desires are infinite and always leap out ahead of whatever has just been achieved. Only Adam II can experience deep satisfaction. Adam I aims for happiness, but Adam II knows that happiness is insufficient. The ultimate joys are moral joys” (p. 15). “Today, commencement speakers tell graduates to follow their passion, to trust their feelings, to reflect and find their purpose in life. The assumption…is that when you are figuring out how to lead your life, the most important answers are found deep inside yourself….You should ask certain questions: What is the purpose of my life? What do I want from life? What are the things that I truly value, that are not done just to please or impress the people around me?” By this way of thinking life can be organized like a business plan….But [she who was called] found her purpose in life using a different method….In this method, you don’t ask, What do I want from life? You ask a different set of questions: What does life want from me? What are my circumstances calling me to do? In this scheme of things we don’t create our lives; we are summoned by life. The important answers are not found inside, the our found outside. This perspective begins not within the autonomous self, but with the circumstances in which you happen to be embedded. This perspective begins with an awareness that the world existed long before you and will last long after you, and that in the brief span of your life you have been by fate, by history, by chance, by evolution, or by God into a specific place with specific problems or needs. Your job is to figure certain things out: What does this environment need in order to be made whole? What is it that needs repair? What tasks are lying around waiting to be performed?” (pp. 21, 22). “Few people are put in circumstances that horrific and extreme [as Viktor Frankl in concentration camps during WWII], but all of us are given gifts, aptitudes, capacities, talents, and traits that we did not strictly earn And all of us are put in circumstances that call out for action, whether they involve poverty, suffering, the needs of a family, or the opportunity to communicate some message. These circumstances give us the great chance to justify our gifts” (p. 24). “A vocation is not a career. A person choosing a career look for job opportunities and room for advancement. A person choosing a career is looking for something that will provide financial and psychological benefits. If your job or career isn’t working for you, you choose another one. A person does not choose a vocation. A vocation is a calling. People generally feel they have no choice in the matter. Their life would be unrecognizable unless they pursued this line of activity” (p. 24). “A person with a vocation is not devoted to civil rights, or curing a disease, or writing a great novel, or running a humane company because it meets some cost-benefit analysis. Such people submit to their vocations for reasons deeper and higher than utility and they cling to them all the more fiercely the more difficulties arise” (p. 25). “She [Frances Perkins]…reflected on a distinction that had once seemed unimportant to her. When a person give a poor man shoes, does he do it for the poor man or for God? He should do it for God, she decided. The poor will often be ungrateful, and you will lose heart if you rely on immediate emotional rewards for your work. But if you do it for God, you will never grow discouraged. A person with a deep vocation is not dependent on constant positive reinforcement. The job doesn’t have to pay off every month, or every year. The person thus called is performing a task because it is intrinsically good, not for what it produces” (p. 44). “The essential drama in life is the drama to construct character, which is an engraved set of disciplined habits, a settled disposition to do good. The cultivation of Adam II was seen as a necessary foundation for Adam I to flourish” (p. 53). “Knowledge is not enough for tranquility and goodness, because it doesn’t contain the motivation to be good. Only love compels action. We don’t become better because we acquire new information. We become better because we acquire better loves. We don’t become what we know” (p. 211). “Education is a process of love formation. When you go to school, it should offer you new things to love” (p. 211). “He [Augustine] started with the belief that he could control his own life. He had to renounce that, to sink down into a posture of openness and surrender. Then, after that retreat, he was open enough to receive grace, to feel gratitude and rise upward. This is life with an advance-retreat-advance shape. Life, death, and resurrection. Moving down to dependence to gain immeasurable height” (p. 211). However we have an “innate tendency toward selfishness and overconfidence.” We tend to see ourselves as “the center of the universe” (p. 262). Even though we are flawed, we are “splendidly endowed.” We do sin, but we “also recognize our capacity for sin” (p. 262). Humility – having an accurate assessment of our own nature and our place in the cosmos – is our “greatest virtue” (pp. 262, 263). Thus “pride is the central vice” because “it blinds us into thinking we are better than we are” – our abilities and moral weaknesses (p. 263). “The struggle again sin and for virtue is the central drama in life” (p. 263). Character is the result of “inner confrontation.” It is “a set of dispositions, desires, and habits” that are slowly developed through a “thousand small acts of self-control” (pp. 263, 264). 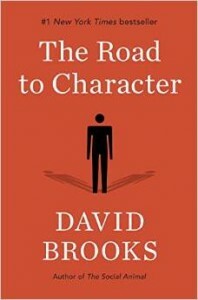 What leads us astray are short term things: “lust, fear, vanity, gluttony.” The dimensions of character, in contrast, are long-term in nature: courage, honesty, humility” (p. 264). No one can achieve mastery of the virtues alone (p. 264). “We are all ultimately saved by grace. The struggle against weakness often has a U shape….The shape is advance-retreat-advance” (p. 265). “Defeating weakness often means quieting the self” (p. 265). Wisdom begins with knowing our limitations (p. 265). The good life is not possible “unless it is organized around a vocation….Vocation is found by looking without and asking what life is asking us. What problem is addressed by an activity you intrinsically enjoy?” (p. 266). 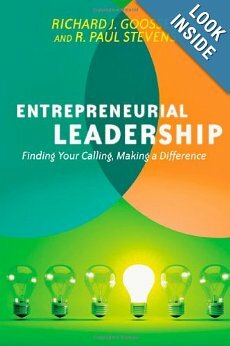 “The goal of leadership is to find a just balance between competing values and competing goals” (p.266). “The person who successfully struggles against weakness and sin may or may not become rich and famous, but that person will become mature….A mature person possesses a settled unity of purpose” (p. 267). Opus is an end-of-academic-year festival of scholarship at Trinity Christian College and includes presentation and performances. Even a parade! Dyvon shares info about marketing consulting project at Opus. Last night at the E-Club event the Future Founders Foundation (http://futurefounders.com/about/) gave its FFScholars awards for participation in entrepreneurial efforts during the 2015/2016 school year. TCC was the initial partner with FFF in offering this program.Award winners from Trinity included: Anthony Dykstra, Platinum; Dyvon Melling, Platinum; Ryan Hesslau, Gold; Tanner VanMaanen, Gold; Tyler Schneider, Gold; Jordan VanderKamp, Silver; Casey Huisenga, Silver; Azariah Pargulski, Blue; Craig Vandergalien, Blue; Keegan VanMaanen, White; Zack Austell, White; Cynthia Gliwa, White; Sarah Kooiman, White; Jared Mulder, White; Katlen Siwinski, White. In addition, Tony Dykstra was given the Outstanding Leadership Award. And thanks to Kyle Harkema and Rick Hamilton for coaching and connecting Future Founders to Trinity.